I have a lot of non-traditional baseball caps, but the one that draws the most comments is a sky blue cap from LEGOLAND California. It's not flashy, it just says LEGOLAND, and people (whether they are closeted or active fans) like to talk about LEGO bricks. 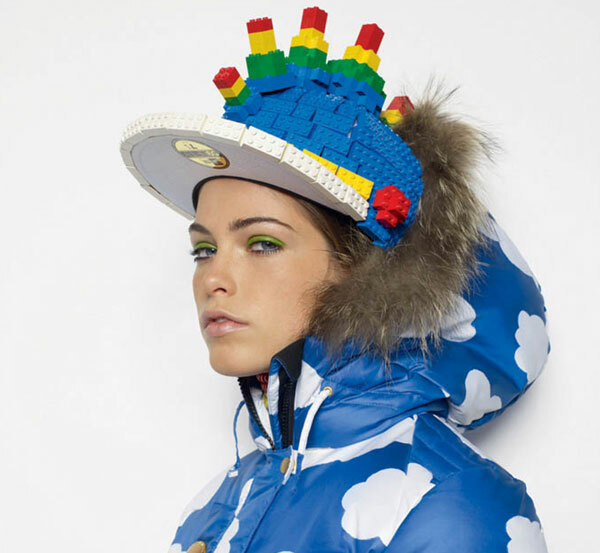 But (sadly) I've got nothing on my hat hooks to compare to the above design by French designer JC de Castelbajac, who apparently covered New Era baseball caps in LEGO pieces for a recent fashion show. While purists will be disappointed to learn that glue was likely involved, the final result suggests that on occasion glue might allow for something wonderful to happen. I imagine the caps were a bit heavy, sort of the children's version of Vegas showgirl's headpieces and they're delightfully impractical. But a LEGO cap would be a sweet addition to anyone's hat hook.